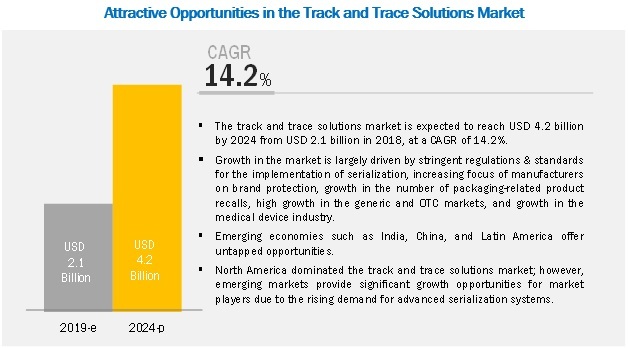 [301 Pages Report] The track and trace solutions market is projected to reach USD 4.21 billion by 2024 from USD 2.16 billion in 2019, at a CAGR of 14.2%. The major factors driving the growth of this market include the stringent regulations & standards for the implementation of serialization, increasing focus of manufacturers on brand protection, growth in the number of packaging-related product recalls, and growth in the medical device industry. On the basis of end user, pharmaceutical & biopharmaceutical companies segment is expected to account for the largest share of the market in 2019. The large share of the market is mainly due to factors such as the growing number of counterfeit drugs, specifically in developing countries, and stringent regulations for the pharmaceutical packaging industry. Based on applications, the track and trace solutions market is segmented into serialization; aggregation; and tracking, tracing, & reporting. The serialization segment accounted for the largest share of the applications market. The increasing number of counterfeit drugs and stringent government regulations for the implementation of serialization is driving the track and trace serialization solutions market. The track and trace solutions market in APAC is expected to grow at the highest CAGR during the forecast period. The expanding pharmaceutical market and the implementation of stringent regulations to enhance the quality and reliability of pharmaceutical drugs are the key drivers for market growth in this region. Prominent players in the global track and trace solutions market are OPTEL Group (Canada), Mettler-Toledo International Inc. (US), Systech International Inc. (US), TraceLink Inc. (US), Antares Vision (Italy), SAP (US), Xyntek Inc. (US), Adents International (France), SEA Vision Srl (Italy), Robert Bosch (Germany), Körber Medipak Systems AG (Switzerland), Siemens AG (Germany), Uhlmann Group (Germany), Jekson Vision (India), Videojet Technologies, Inc. (US), Zebra Technologies Corporation (US), Axway Inc. (US), NJM Packaging (US), rfxcel Corporation (US), ACG Worldwide (India), Laetus GmbH (Germany), WIPOTEC-OCS (Germany), Domino Printing Sciences plc (UK), Kevision Systems (India), Grant Soft (Turkey), SL Control Ltd. (US), and Arvato Bertelsmann (Germany). In 2018, Antares Vision launched its product, ATSFOUR, an enterprise-level serialization software solution. The new ATSFOUR integrates the Antares Tracking System architecture and offers a comprehensive solution which allows the widest connection capability for any traceability network. In 2018, Ropack Pharma Solutions (Canada) signed an agreement with TraceLink (US) in order to achieve DSCSA compliance for its pharmaceutical customers. In 2017, OPTEL Group (Canada) acquired Verify Brand LLC (US). The addition of Verify Brand’s L4/5 serialization capabilities to the OPTEL solution set enables the connectivity required for pharma companies to implement Track & Trace across the entire supply chain (L1 to L5). In 2017, Antares Vision extended its partnership with Xyntek, wherein Xyntek will continue to sell and service solutions of the Antares Tracking System platform throughout the US. Where will all these developments take the industry in the medium to long-term? Who are the major applications of track and trace solutions? Which are the major track and trace solutions segments? Which technologies are mainly used for track and trace? Who are the major end users of track and trace solutions? This study involved the extensive use of both primary and secondary sources. The research process involved the study of various factors affecting the industry to identify the segmentation types, industry trends, key players, competitive landscape, competitive leadership mapping, key market dynamics, and key player strategies. Secondary research process involves the widespread use of secondary sources, directories, databases (such as Bloomberg Businessweek, Factiva, and D&B Hoovers), white papers, annual reports, company house documents, investor presentations, and SEC filings of companies. Secondary research was used to identify and collect information useful for the extensive, technical, market-oriented, and commercial study of the track and trace solutions market. It was also used to obtain important information about the key players and market classification & segmentation according to industry trends to the bottom-most level, and key developments related to market and technology perspectives. A database of the key industry leaders was also prepared using secondary research. In the primary research process, industry experts from both the supply and demand sides were interviewed to obtain qualitative and quantitative information for this report. Industry experts from the supply side include suppliers, distributors, CEOs, vice presidents, marketing and sales directors, business development managers, and technology and innovation directors of track and trace solutions providers, whereas, industry experts from the demand side include industry experts such as vice presidents & directors of pharmaceutical, biopharmaceutical, and medical device companies, contract manufacturing organizations, directors of cosmetic companies, directors of clinical laboratories, software application experts, and other related key opinion leaders. The market size estimates and forecasts provided in this study are derived through a mix of the bottom-up approach (revenue share analysis of leading players) and top-down approach (assessment of utilization/adoption/penetration trends, by product, technology, application, and end user). After arriving at the market size, the total track and trace solutions market was divided into several segments and subsegments. Data triangulation and market breakdown procedures were employed, wherever applicable to complete the overall market engineering process and arrive at the exact statistics for all segments & subsegments. North America, Europe, APAC, Latin America, Middle East, and Africa. A further breakdown of the Rest of Latin American track and trace solutions market into Argentina, Chile, Peru, and Colombia and others.